* This review may contain spoilers for the previous book, Half Bad. To Sum It Up: Nathan may be on the run from the Hunters who want to kill him, but there’s a life that he values more than his own. He’ll do anything, even risk death at the hands of the hated, merciless Hunters, to wake Annalise, one of the few people to touch his heart, from the deep sleep that only another witch with highly dubious motives can release her from. Nathan himself must warily join forces with some rather suspect “allies” in order to even have a chance of saving Annalise, and their assistance comes in exchange for playing a key role in furthering an agenda that will impact all witches, both Black and White, across Europe. Review: Half Bad turned out to be a neat surprise when I read it last year. At first the narrative style, which often has a stream of consciousness feel to it, made me a little hesitant, but my doubts were quickly squashed by the utterly compelling story of Nathan, a witch persecuted for most of his life by the Council of White Witches for being a Half Code, the son of a White Witch and England’s most dangerous Black Witch. Half Wild finds Nathan now in possession of his Gift, the special ability that every witch has and which varies from witch to witch. Nathan’s Gift, which is the same as that of his notorious father, Marcus, is powerful and a struggle for him to control; he has zero memory of turning into an animal, and a predatory one at that because sometimes he wakes up covered in blood. Quite a bit of blood gets spilled in Half Wild, as the Council of White Witches steps up its efforts to eradicate Black Witches as well as punish any of its own who are not 100% loyal to the Council. The developing resistance movement recruits Nathan to join against an organization that he’d love to pulverize, but it’s an uneasy allegiance, with mistrust lingering on both sides. I’m not always into the political aspects of a novel, but this particular plotline, coupled with a ton of action, is potent. I think my favorite thing about this series so far is the complexity of Nathan’s character. He knows he’s far from being a hero, and he’s not trying to be one, either. And that’s what I find truly appealing about his character—that there’s so much gray to it. I love that his narration consists of his unfiltered thoughts and that he often doesn’t have a filter when interacting with other characters. Nathan’s slightly unconventional narrative voice may not hit the right note with everyone, but for me, it’s made both books in this series extremely difficult to put down. I wasn’t sure if Half Wild would match the excellent pacing of Half Bad, but it absolutely does. 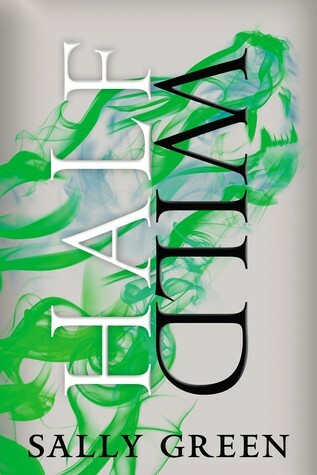 I loved Nathan’s friend Gabriel in Half Bad, and I love him even more after reading Half Wild. His devotion to Nathan is completely unwavering; even when Nathan fails to appreciate this fact, Gabriel is still there, still ready to do anything to help him. Of the new characters introduced in Half Wild, I took an immediate liking to Nesbitt, a witch whose snark rivals Nathan’s. Nesbitt takes great joy in winding Nathan up, and their verbal volleys provide some welcome comic relief. Overall, Half Wild delivers all of the progression a reader could ask for from a sequel. I even about almost started crying at one point because a particular scene was so perfectly written. I’m glad that Ally urged me to pick this up because I hadn’t realized how much I missed the series until I stepped inside Nathan’s world once again. All in All: No sequel disappointment here—at. All. This is an awesome series if the narrative style is a fit for you. It was for me in Half Bad and continues to be very much so in Half Wild. I'm really looking forward to you starting this series! :D It's unlike other books I've previously read about witches, especially the way the narration is structured at times. I don't find it gimmicky at all, though, and I hope you'll dig it as much as I did! Nesbitt! What a unique name and combined with a fab personality I think she'll be my fave! Nesbitt is really, really funny and was an instant fave!